The undergarment of the guys in the photo of “Yakuza: We Have to Evolve Our Business Model” is a fundoshi, the traditional Japanese undergarment for men. However, after World War II, when Americans ran the show, it lost the popularity war with white briefs. Nowadays, it’s mainly used during festivals to show off machismo—to gird their loins for performance. For the Sanja festival of Asakusa, one of the wildest and largest Shinto festivals in Tokyo, 70% of the clubs that carry the portable shrines (mikoshi) are dominated by yakuza, according to research conducted in 2007 by Tokyo’s Metropolitan Police. The festival is another source of money for them. They show off their tattoos, become a tourist attraction, and charge club members who want to perform on the mikoshi bars—strictly forbidden by the event organizer. 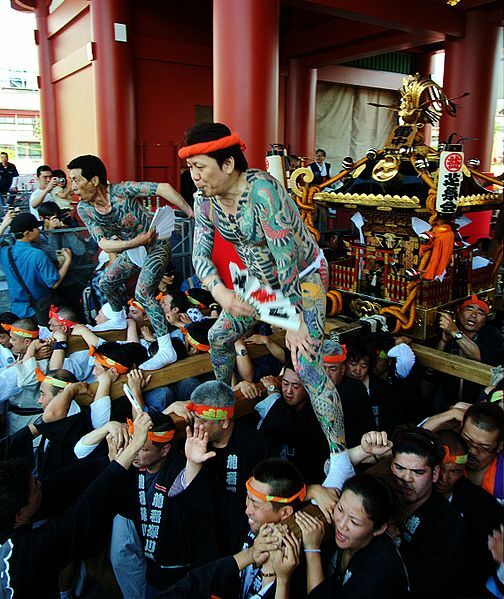 Mikoshi are sacred, and standing on their bars is a total no-no, yet prevalent. Another economic hit to the yakuza: This year’s festival was cancelled due to Tohoku Kanto Great Earthquake.